Some products are just worth the splurge. The biggest reason I go the salon for my weekly mani/pedi, is so that I don't accidentally smudge my nails. I don't always have the time to wait for them to dry and I don't have one of the quick dry machines either. There are sprays you can apply to the nails to speed up the drying process, but they leave my hands feeling greasy afterwards. For you on-the-go ladies, O•P•I has the solution. 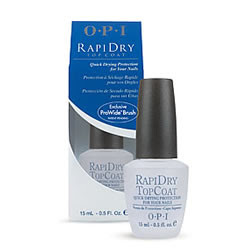 If you haven't already tried, Rapi Dry Top Coat ($11.95) you must be made aware of that it works wonders. You brush it on your nails, as if painting them, and it dries in about five minutes to a hard glossy finish. With this you can do your nails on your own; smudge and streak free. Think of it as an investment for your nails.